Cordless vacuum cleaners tend to have weaker suction, which makes them weaker vacuums. Because creating strong suction requires a lot of energy, and that can be straining for battery-powered devices. In the interests of having a vacuum last longer than 5 minutes, most portable vacuum manufacturers create equipment that’s only capable of modest suction power. But depending on the mess, weaker suction can be a deal breaker. At best, it’s frustrating when you start running over debris and it doesn’t get picked up. At worst, it requires you to use a separate vacuum. Clearly, power and portability can be tough to combine in meaningful ways. 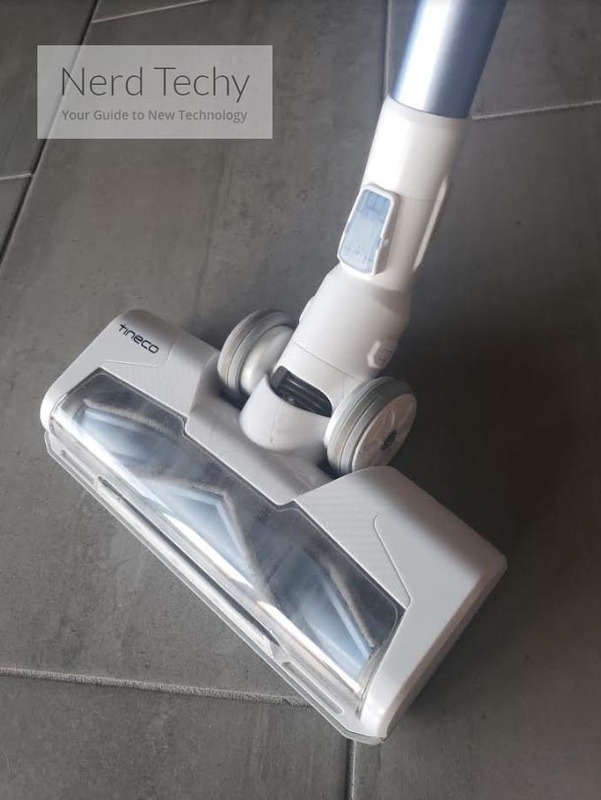 The Tineco A11 is part of a long series of portable vacuum cleaners. Compared to the A10, the A11 represents a small but steady improvement in design. It has an improved battery capacity, storage capacity, and even improved suction power. Like with the previous generation, the A11 is actually available in two different types: Master series and Hero series. The Hero is basically a watered-down version of the Master. It’s made to provide essential functionality without as much adaptability. The A11 Hero includes a bunch of extra cleaning accessories, but the difference between them isn’t as simple as that. 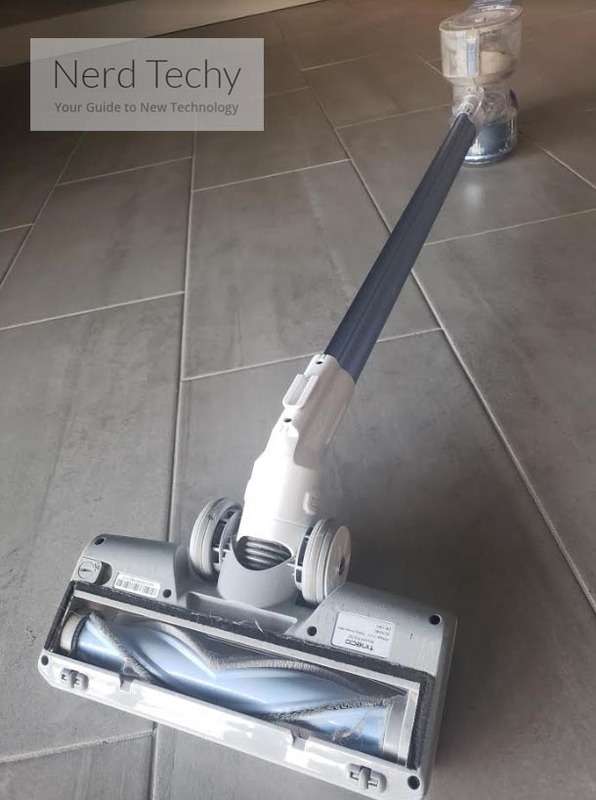 The A11 is the fundamentally superior unit because it contains an additional LED soft roller power brush, granting it far better cleaning potential when working on hardwood or stone floors, and for picking up larger pieces of debris. But that’s really just the tip of the iceberg. The A11 was constructed with a bright metallic teal chassis. It may or may not be your favorite color, but the A11 does happen to represent the very best this series has to offer. It’s got a much better battery life than the A10 Hero and A10 Master, and a more sophisticated roller system than the A11 Hero. When you understand exactly how popular the A10 Master happens to be, it’s pretty stunning that there was this much room for improvement. But much of the most important differentiation occurs when it comes to the included vacuum accessories, which we’ll get to in a moment. Tineco’s LED power brushes are fairly ideal for taking care of different types of floors and different variants of dirt and debris. But it’s being able to switch between different types of floors that really makes the A11 Hero live up to its name. Because that kind of adaptability and customization is exactly what allows it to shine when deployed in the field. The A11 Hero was designed with extra cleaning capabilities for harder surfaces, like stone floors. It was made to almost functionally eliminate the need for a broom because it’s capable of picking up bigger pieces of debris. Though not everyone will end up cleaning stone or hardwood flooring, if that’s something you’re going to come across, the A11 ought to immediately stand out. It works pretty well, in large part due to a four-part filtration system. But it really owes its success to what they’ve called the extreme suction system, which is operated by a 120W engine. The total suction of this device is roughly five times the capabilities of atypical cordless vacuum. 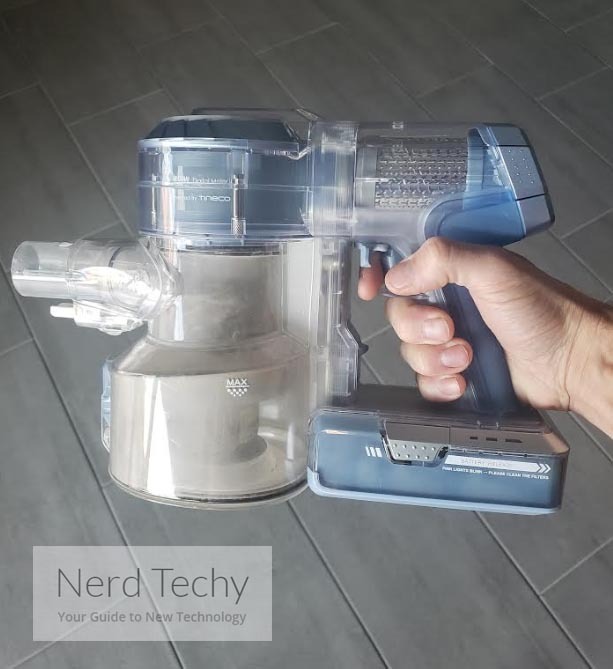 That’s a lot of power, but you really want to keep your power consumption down, and only use as much suction as is necessary to finish the job. 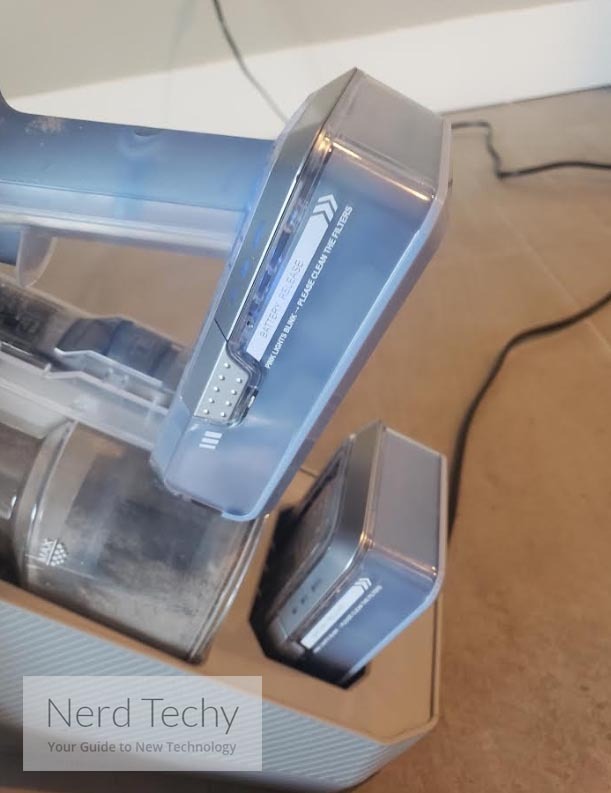 Because being able to toggle between various levels of suction power is essential to maintaining a lengthy battery lifespan, and still having the power onboard necessary to compare with wired vacuums. The A11 has a variety of different modes and features that let you adjust suction to meet your current needs. It also has enough suction power to trick you into thinking it’s a corded vacuum cleaner, at least temporarily. Though switching to the high-suction mode will tear through the battery, being able to turn-up the power is critically important when you’re trying to pull-up stubborn bits of dirt and debris. You generally don’t need that kind of suction for hardwood floors, but it can be a necessity for deep cleaning carpets. Much of the cleaning potential of the A11 is really wrapped up in the included accessories. The A11 Hero Cordless Vacuum Cleaner includes a rinse-free pre-filter cleaning tool, a hair cleaning tool, and extra pre-filter. 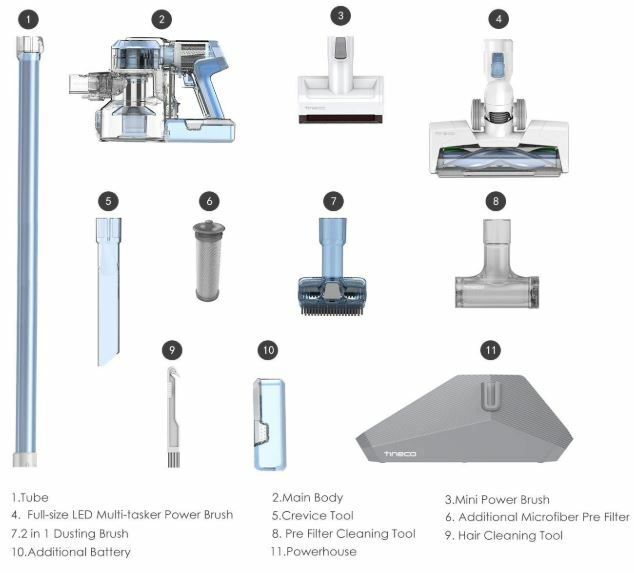 It also comes with more than half a dozen accessories, including a mini power brush, 2-in-1 dusting brush, multi-angular tube, extension hose, crevice tool, and a long-soft crevice tool. Whether you’re looking for short or long, angled or open, these attachments let you get into tight spaces and take care of cleaning. Most people in most circumstances will find these attachments are more than enough for cleaning corners, handling edges, and so forth. It’s also possible to replace these attachments if you happen to lose one, though you do have to buy them in a kit. Again, the A11 was constructed with a pair of separate lithium batteries. But you can actually charge both of them at the same time. If you’re in a rush, it’s also possible to swap over to separate sets of batteries, though you’d have to pick them up separately because additional ones aren’t included with the A11. Depending on what you’re looking for, the A11 lets you choose simplicity, or lets you adapt to more advanced and involved use cases. With the maximum settings locked in, you’ll get 15 minutes of deep cleaning. When you’re not using the maximum suction settings, you’ll be able to get closer to a full hour. The amount of time you end up with really depends on how often you have to increase the suction power. But the amount of suction you get from the lower setting ought to meet or exceed the needs of most smaller cleanup jobs. Vacuums tend to be loud, especially powerful ones. The A11 isn’t quite as loud as many wired vacuums, but it’s certainly much louder than most wireless ones. Vacuum cleaners typically operate at such high volumes, they’re capable of causing hearing damage after a few hours of exposure. The A11 is isn’t quite as severe as that, but it wouldn’t be a bad idea to wear hearing protection if you planned on using the 120W engine to its maximum potential for more than a couple minutes. 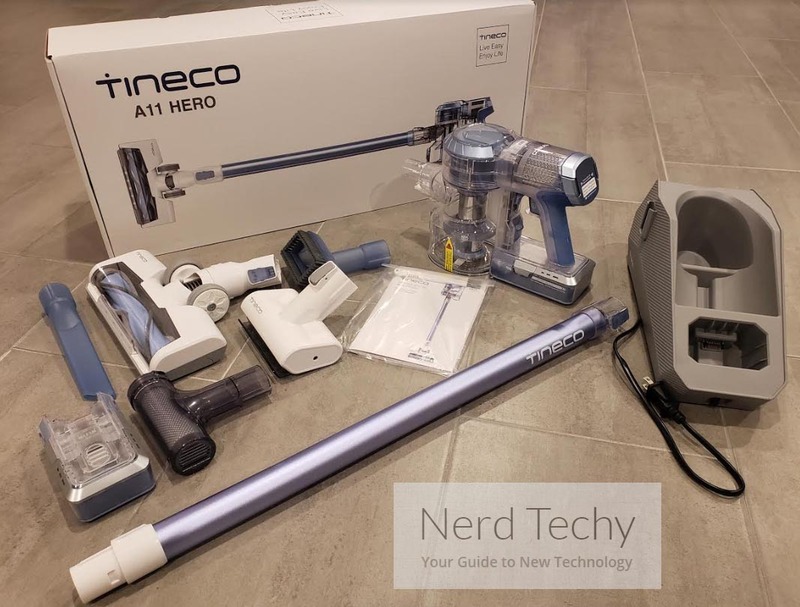 The Tineco A11 was constructed with a four stage filtration system, which is considerably more advanced than the kind of filtration you typically see in portable vacuum cleaners. It’s even a tad more advanced than the filtration you’ll see on some basic wired vacuums, too. Without getting into every dirty detail, their filtration system is pretty good at sorting through bits of dust and larger chunks of debris equally well. Cleaning the filters only takes a couple of seconds, and maintenance remains simple because of the higher capacity dustbin. Just how high capacity are we talking about? While Tineco thinks their dustbin is about 50% larger, but in some cases it’s at least twice as large as competing cleaners. It can actually hold slightly over half a liter, which is about 20 ounces. That’s basically the size of two cans of soda. It may be worth noting that emptying the dustbin is fairly simple and intuitive as well, though that’s not too uncommon for a bag-free design these days. Midrange vacuums have had that worked out for a number of years now. The Tineco A11 Hero has a continuous power mode, so you don’t have to hold down the trigger. For someone who’s trying to clean for more than a couple of minutes, that can be pretty important. Being able to accommodate cleaning sessions that last longer than a couple of minutes is really a defining feature of the A11 series. If you were looking for reasons to complain about the A11, its length might be a place to start. When you take off the handle and use it for handheld cleaning, length isn’t a problem, and the A11 feels quite comfortably balanced in your hand. The 5lb weight really shouldn’t get in the way of comfort, either. When you attach the handle, you’ll find it’s a little on the short side. It runs about 27-inches, which isn’t an optimal length for people who are tall. And unfortunately, Tineco doesn’t offer any way to address this problem meaningfully. But it’s a fault that’s rather common to many vacuums, so it’s tough to lay all the blame on the A11. If you were looking for something simpler, the A11 Hero is about 25% less expensive. But not only do you give up seven accessories, you also lose the soft-roller power brush, which was made for bigger pieces of debris and hardwood floors. Whether or not that’s a good trade depends on you. In addition to all the accessories, Tineco includes a two-year warranty on the A11. Who Should Try the Tineco A11 Hero? This is a device that was built with close attention to detail. 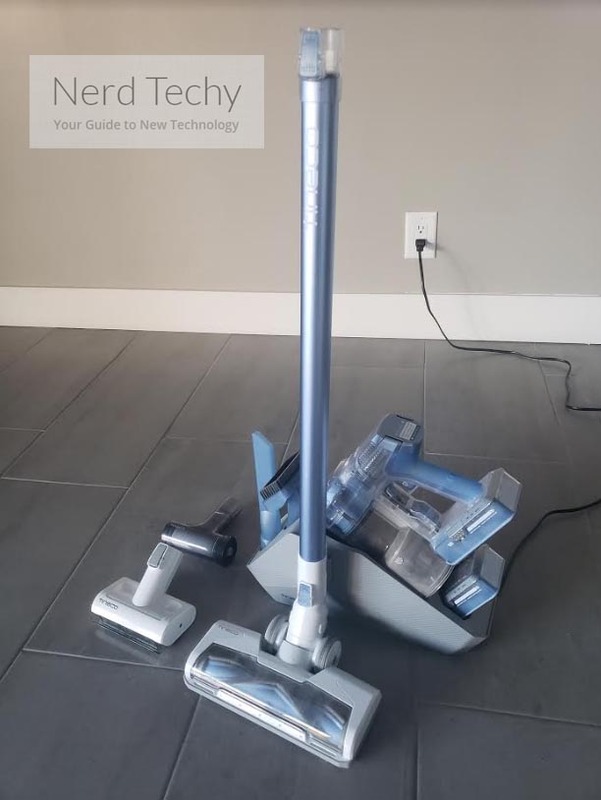 The Tineco A11 Hero gives you everything necessary for floor-to-ceiling cleaning. It provides all the various accessories for almost every conceivable situation, as well as a highly versatile design intended to be able to clean literally any type of indoor floor. Its rechargeable batteries are actually removable, so you could swap to another pair if you needed to exceed the 1-hour limit. Though that’s already a pretty long amount of time for a cordless cleaner, being able to add to it further only helps distinguish the A11. Because the batteries can be replaced, when their performance deteriorates after a couple years of use, replacing them means you don’t have to replace the entire device. All in all, the A11 Hero Cordless Vacuum Cleaner is a good call for someone who’s taking on larger rooms for longer periods of time. 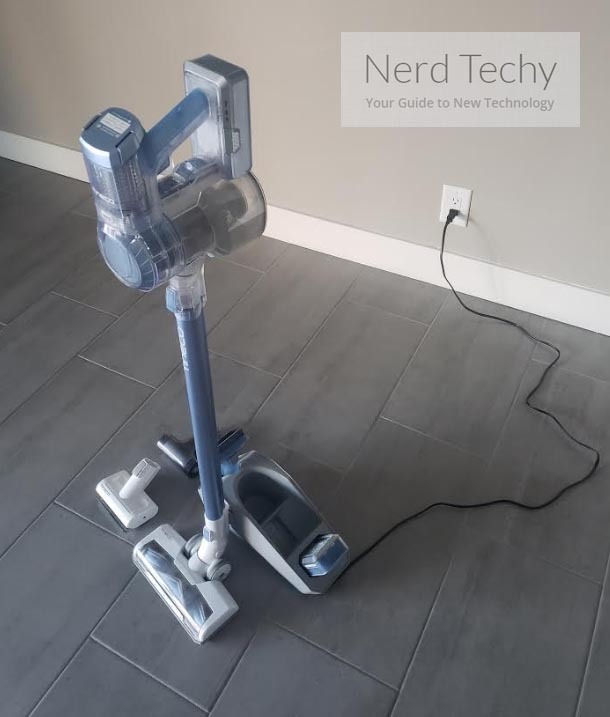 It’s highly adaptable, it’s reasonably intuitive to use, and it avoids basically every problem that people associate with cordless cleaners.